« « Navigate Toward The Past: Found some great old pictures! Sponsor Us In The Walk to D’Feet ALS! Thank you for your interest in helping me reach my Walk to D’Feet ALS® fundraising goal! This is an exciting opportunity for us to work together to support those effected by ALS and to spread awareness of the urgency to find treatments and a cure. As many of your know, our Mother Eileen Prendergast was diagnosed with ALS in August of 2006. We’ve named our team Eileen Team WSB after White Sands Beach, which has always been her favorite place to be and where she wants to stay. The ALS Association has been working to fight ALS through their Walk to D’Feet ALS® program. Every 90 minutes a person in this country is diagnosed with ALS and every 90 minutes another person will lose their battle against this disease. ALS occurs throughout the world with no racial, ethnic, or socioeconomic boundaries. If you choose to walk with me, you will be a part of an exciting, empowering event for patients, family members, friends, companies and organizations across the country; all of whom are walking to support comprehensive patient service programs and leading-edge ALS research. Whether or not you can walk with us, you can play an essential role by sponsoring me. Both walkers and donors directly impact the lives of those affected by ALS by providing the means to raise awareness and to offer the services needed to treat and defeat this disease. Every On-line donation before September 15th is entered to win a 7-Day Royal Carribbean Cruise. 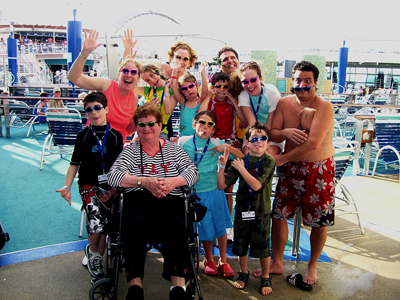 The picture to the right is our family with my mom on Royal Caribbean in April 2007. Not only do proceeds from the Walk go to services that improve the day-to-day lives of ALS patients and their loved ones, but the money we fundraise is directed toward programs that look to the future. Promising research indicates that we are getting closer to finding treatment options and scientists are hopeful that a cure will one day be discovered. Please consider walking with us or sponsoring us. If you cannot sponsor us or walk, please continue to keep our family and our mom in your prayers. With God All things are Possible! Thank you for visiting our walk site.